This video dates back to 2011, but the points that it makes are as true today as they were back then, if not more so. The reasons for this are many, not the least being that Google and the other Search Engines are taking more and more ‘notice’ of the amount of ‘chatter’ or signal that refers to or mentions a domain, site or Brand. 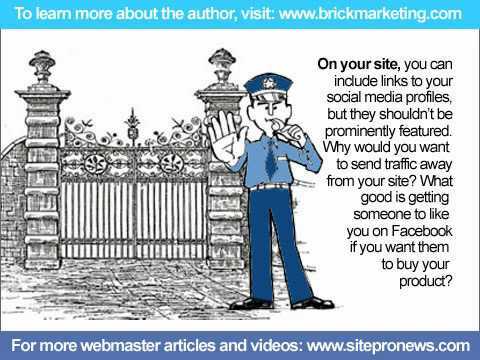 The whole issue here is about making sure that your website, your online presence, is actually seen by people, most importantly, your potential customers. It is not, as many people think, just a matter of creating a website and waiting for the traffic to arrive, no, much more is required than that. There are of course, many different ways of getting your site noticed, including TV and radio advertising (you must have seen lots of adverts saying ring xyz or visit our website at mysite.com?). Paper advertising can also be useful, but with people becoming more and more used to searching for what they want, when they want it, a presence on the Search Engines (or being mentioned by friends or work colleagues on Facebook etc) is becoming more and more important, as you know that when people are interested in your product, they will be able to find you. When it boils down to it, there is no trick in getting a good presence on the Engines, it is a matter of having a good site, which contains plenty of interesting info and having enough people talking about it to make sure that it looks like it is ‘useful’. Much of these two areas are covered by conventional, ‘old fashioned SEO’, but as mentioned above Google does ‘like’ to see a brand being mentioned on Social Media too. You must also not forget that once you have been found, your brand may have to ‘prove itself’ and that includes having favourable reviews and comments, an area that Social Media can really assist with. So read on and we hope you enjoy the video. Plus. Don’t forget, if you are interested in a new website or need some marketing assistance with an existing one, Rouge Media are here to help, just give us a call.